What is Ladies & Gems? 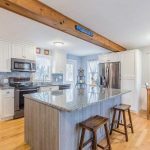 It is the perfect opportunity for a well deserved “Ladies Night Out” featuring a jewelry auction and party hosted by The Newburyport Art Association. This is an evening not to be missed! 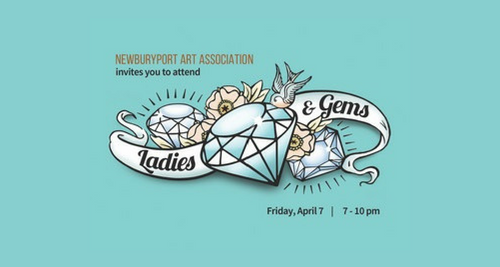 Ladies & Gems will take place Friday, April 7, 7:00-10:00 PM at the Newburyport Art Association, 65 Water Street, Newburyport MA. The night will include jewelry for sale by the NAA’s own artist jewelers, silent auction of jewelry consigned by special NAA friends, music by Liz Frame & The Kickers, refreshments by neighboring restaurants: The Poynt, Brown Sugar by the Sea, and Glenn’s Restaurant & Cool Bar. As part of this special jewelry auction, the NAA is selling raffle tickets for a $5,000 shopping spree at Newburyport’s premier local Jeweler, Kaya Jewelers of Newburyport, MA. Only 250 raffle tickets will be sold and tickets can be purchased at the Ladies & Gems event, or online prior to the event. Raffle tickets are $50 each. Event admission ticket price is $25 – admission will be free with the purchase of 2 raffle tickets. Raffle ticket holders need not attend the event to win the $5,000 shopping spree! Raffle and event tickets may be purchased online via the NAA’s website, www.newburyportart.org. Mark your calendar now for this fabulous jewelry auction. Enjoy a fun evening out with friends all while helping supporting a very important organization in the Greater Newburyport community. Founded in 1948, the NAA is dedicated to promoting and exhibiting our members’ work, providing art education for students of all ages and skills, and keeping the visual arts accessible to students in our local schools and for special needs adults. Today, the NAA has become the cornerstone of greater Newburyport’s vibrant arts scene with over 600 artist members from around the region exhibiting their artwork in a full calendar of open, juried, invitational, featured artist and interest group shows during the year. In addition the Association offers a full calendar of studio classes and workshops for children, teens and adults, and we support two important community outreach programs, ArtLink & OpArt. For further information, please contact the Newburyport Art Association at 1.978.465.8769 or email at naa@newburyportart.org. 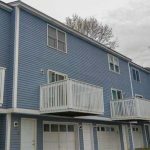 Please visit our website at www.newburyportart.org.